Quicken 2015 2.2.0 – Complete personal finance solution. Quicken 2015 helps you manage all your personal finances in one place, so you can see where you’re spending and where you can save. Quicken automatically categorizes your financial transactions, helps you stay on top of bills and set goals so you can save more. You can even access your data on the go. View All Your Accounts in One Place – See all your bank, credit card, investment and retirement accounts in one place, so you know exactly where you stand. Quicken 2015 downloads your income and expenses from your accounts, so you don’t have to enter transactions manually and avoid the hassle of going to multiple websites. See Exactly Where Your Money Is Going – Quicken 2015 automatically categorizes expenses like groceries, entertainment, and more, so you don’t have to edit them manually. You can easily see where youâ€™re spending and where you can save. Plan, and Stay on, a Budget – We make it easy to get on a budget you can live with. 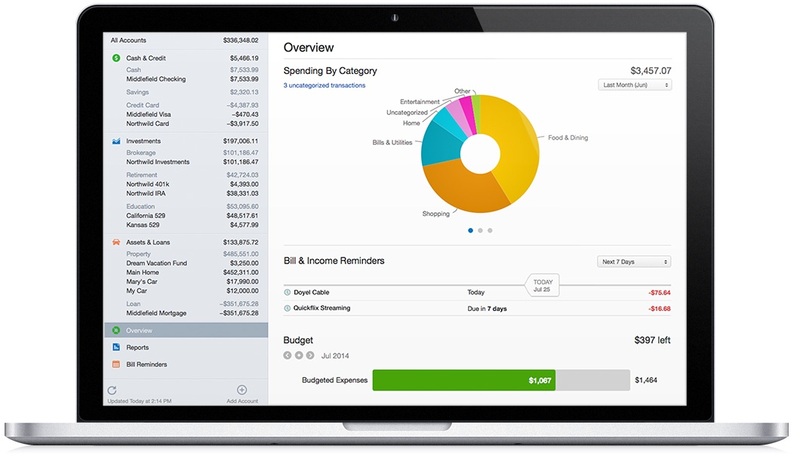 Quicken 2015 automatically sets up budget goals based on what you’ve spent in the past. You can customize your plan, and we’ll track your progress. Never Miss a Bill – Quicken 2015 automatically creates bill reminders for you based on your previous bills; you can customize or add reminders as needed. Weâ€™ll alert you when bills are coming up, so you can pay them on time and avoid late fees. Manage Your Investments and Plan for Taxes – See how your investments are performing. Weâ€™ll continuously update quotes to keep your portfolio value current. We make tax time easier by tracking cost basis estimating capital gains, and creating Schedule D tax reports. Import Data From Previous Quicken Versions – Easily import data from Quicken Essentials, Quicken 2007, and Quicken Windows 2010 or newer versions. Quicken 2015 for Mac supersedes Quicken 2007 and Quicken Essentials (previously, both apps were offered for sale next to each other). Added a new feature to help you get setup for automatic downloads. Choose Accounts > Setup Automatic Downloads and we'll help you get your existing Quicken accounts setup for Automatic Download when available. If you've recently converted from Quicken Windows or Quicken for Mac 2007 and have had trouble downloading, please give this new tool a try. A ton of Download Matching improvements. For all of you that both manually enter transactions and download from the same account. Investing transaction matching! Now manually entered investing transactions will match downloaded transactions. No more manual matching required (though you can still drag-and-drop to match transactions if something is missed). Much improved transaction matching for cash & credit accounts. We've completely overhauled our download matching logic. Users that enter manual transactions and also download from the same accounts should see significant improvements. Transfer matching. We now attempt to detect matches when you edit a downloaded transaction to make it into a transfer. And how could we improve matching without doing the same for Un-matching: Added the ability to un-match a transaction even if you've already edited the matched transaction. Merge Securities: Added the ability to merge securities in the Security List. If you see duplicates of the same security in your Portfolio or Security List, you can now merge them to have just one instance. This could also (optionally) be used in the case of a ticker symbol change for merging the old and new symbols while preserving the price history. System date setting is now used for register date field. Fixed issue that could result in a synced account to no longer show up on mobile if the financial institution or connect method changed. Next story Vitamin-R 2.20 – Personal productivity tool. Previous story CleanMyPhone 3.0 – Keep your iPhone, iPad, or iPod touch clean and well-organized. Squirrel 0.9.4 – Simple way to track and plan finances. iFinance 4.3.5 – Comprehensively manage your personal finances.